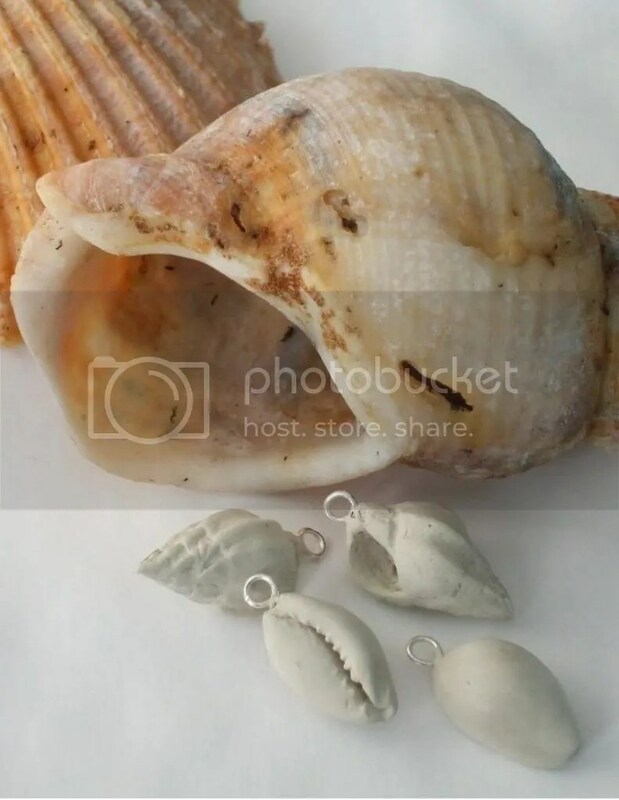 Today I decided to make a second shell of each type out of Precious Metal Clay..after all, if they turned out fine I would then have 2 pairs of silver shells suitable for earrings…and if they didn’t really match at the end of the day, I will have a collection of silver shell charms to hang on some of my charm bracelets or make summer themed cluster pendants from, with the addition of a few well chosen beads and pearls. I also cleaned up all the shells a little more and drilled tiny holes into the ends of them and embedded handmade jumprings on pegs into them, using PMC slip. When all was dry I fired up the kiln and popped them in. When I was making the shells I put a small ball of combustible material into the centre of each piece as I was casting them in the mould. This meant that when the pieces were in the kiln the combustible material would burn off leaving a hollow centre to the shells. This makes the shells look more authentic when they are fired because you can see into them rather than them being a solid lump. This is a photo of the shells after they have been fired and given a quick brush with a brass brush. They need to be given a good polish up before I start to try and enamel them…but I don’t have time for that today. I am very pleased with the way they have turned out…and, bearing in mind that this photo of them is HUGE in comparison to their actual size the little pock marks that you can see are hardly noticeable with the naked eye. That said – nothing in nature is perfectly flawless – so I can live with a few little marks!! 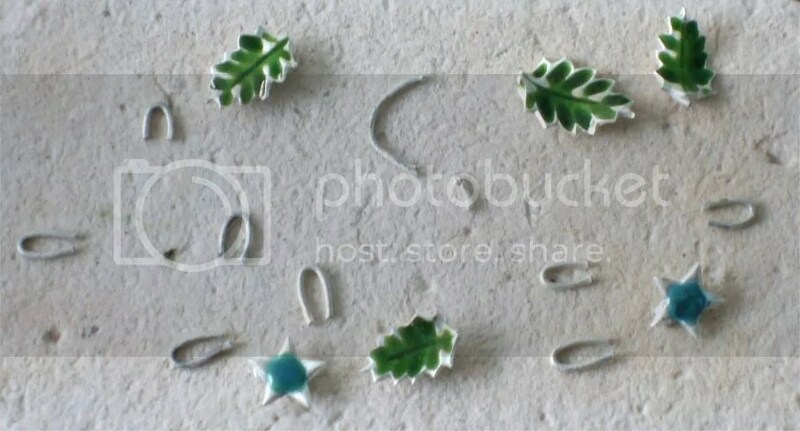 Hopefully tomorrow I will get some enamelling done! Is there anyone else out there that is trying to get to grips with Argentium silver and not exactly meeting with success?? I have tried to find information on other people’s experiences with it but have come up with very little success so far…but I will keep looking!! I am a really recent convert to making jewellery with silver so I don’t have a lot of experience of working with the metal to really know what to expect when faced with Argentium! But I have always been one to have a go and experiment! 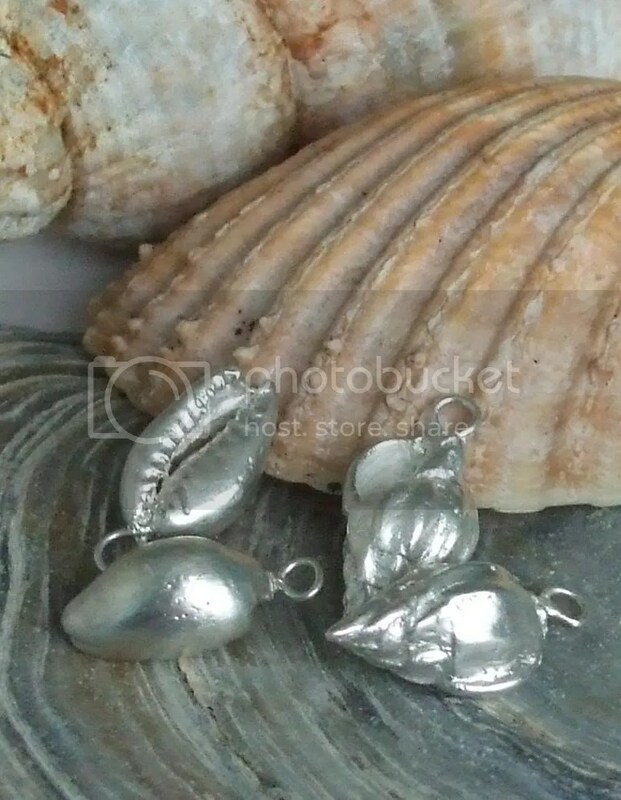 I love working with pure ‘fine’ silver…it is just so clean and beautiful to work with….but it is not a very strong metal. So although I make chunky, decorative chains from fine silver and use pmc with it as well, I am very aware of its limitations. That is why I was very excited when Argentium was finally available in the UK! I have made earwires and catches with it since July with great success but I thought it was time to get more serious with it…and I especially wanted to see how compatible it is with pmc….so I have been having a play with it this week… Can I just say that I am pretty new with pmc as well…and am reluctant to commit large pieces of it to experimentation!! Trying to get it tight round a mandrel was impossible – although I taped it into place! See the gap that sprung open as I cut through the rings!!! Anyway – I persevered… I have already discovered that Argentium fuses really well…doesn’t even need a flux…and amazingly it goes silver again as it reaches fusing temperature! Can you spot the difference between the fused and non fused rings here!!! So now we have my little pmc additions. I have previously tried attaching stars and holly leaves to elongated Argentium jumprings using pmc slip with some success and discovered that if the attached area is too great it causes the Argentium to distort alarmingly! So I have been very careful of the way I have attached them this time. 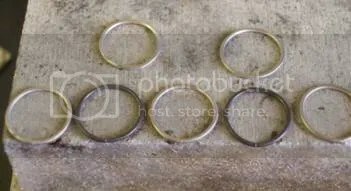 The rings were real experiments where I literally only attached the rings to the back with 3 or 4 little spots of pmc slip…just to see how strong a bond this would make! Well – you can see by the results that the rings have distorted pretty dramatically here so obviously the Argentium has adhered pretty well to the pmc even with a few dabs of slip!! I am still pretty shocked by the extent of the blackening of the Argentium though – considering how bright it was after fusing it! It is so thick it is actually pinging off the surface in little flakes!! So I plopped them all into pickle after they had all cooled down a bit! and they came out looking lovely! But as I gathered them all together I felt a horrible crunching noise in my hand and—– disaster!! The ring from the ivy leaf – which had distorted so much in firing had snapped! 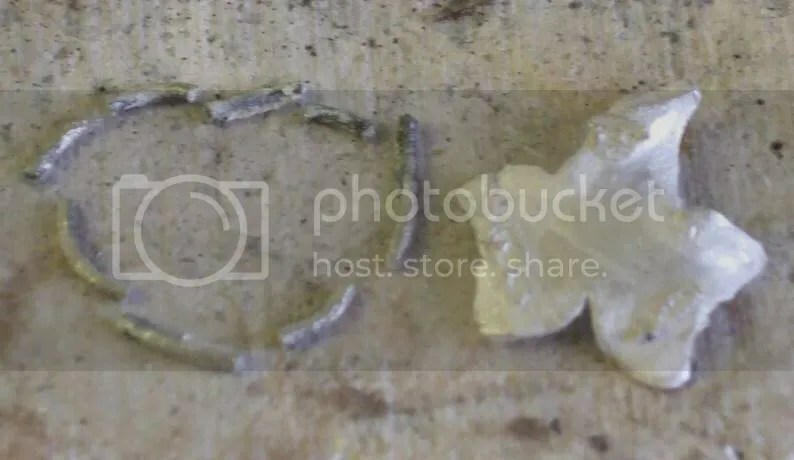 And as I manipulated it more I discovered that not only had it snapped but that I could break the rest of the Argentium off of the pmc leaf just using my fingers – and worse still…it snapped just like a piece of dry spaghetti!! But I plodded on with my plans and popped a bit on enamel onto the pieces that were left…only to get distracted at the vital moment and ended up leaving them in the kiln for much too long…so that wasn’t much of a success either!! A bit of a bad day all in all!! (And it does get worse!!) But look again!! …why has the Argentium not blackened this time? 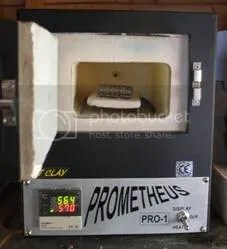 I fire my pmc and my enamel at the same temperature 820 degrees C – so why did it go black when fired with pmc but not when enamel firing and accidently leaving it in a hot kiln for the same sort of time?? Having messed these up I left them to cool in the kiln and had an evening with my grandchildren before looking at the pieces this morning….and yes…I couldn’t resist a fiddle!! I could tell that the wire was just not feeling right…no where near as fragile as the ivy leaf ring was – but obviously not good…and there we go…. A pile of so much scrap!! The broken wire I have discovered balls up beautifully – so perhaps that is not entirely wasted…but I can’t think how to salvage the pmc!! I don’t know what I have learned from all this yet…and would welcome any comments!! Perhaps Argentium isn’t compatible with pmc…not with a physical bond anyway. I am thinking that the shrinking process with the pmc3 is disturbing the Argentium when it is at its weakest and most brittle state and causing it to shatter all through. Perhaps it can only fire with pmc at its lowest firing temperature. Perhaps it is only safe to use it with a mechanical attachment to pmc pieces…. Perhaps I will just go back to fine silver!! As I have said above…I would really welcome any comments…and would love to have some information on how you have found Argentium to perform in the workshop…and with pmc if you have tried it!! I can’t believe how long it has been since I last put a post on here…I am so sorry – I got a little sidetracked!! One of the suppliers I use in the UK to get my fine silver sheet, precious metal clay (pmc) and Argentium silver – Cooksongold.com – has just started a forum. That may not sound too exciting – certainly not to many of you in the US as you seem to have so many of them (which we have looked at with envy from afar) but it is pretty much the only one devoted to jewellery (as far as I know) in the UK. It has opened up a whole new world to me!! I have had the chance to talk to people that know what I am talking about – and have experienced the same problems we have as jewellery makers in the UK – and talk about places and businesses that I have heard of and can access!! It all seems so friendly…and yes…I have to admit it…I am just a bit addicted…no….majorly addicted!! I am finding it really hard to drag myself away from the computer in order to make some jewellery…not just talk about it!! 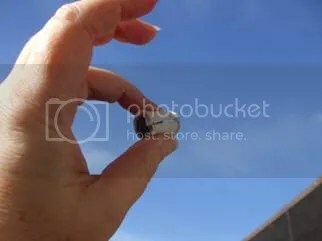 Then on Friday lunchtime I got a commission – a bit of a rush job – to make a pmc (precious metal clay) charm to go on a bracelet – to be ready for Saturday lunchtime! Well, that stressed me a bit I can tell you! But I got it finished, packaged and delivered in time! 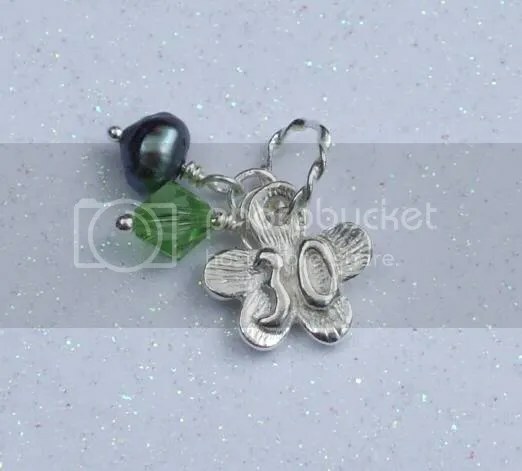 This is the front and back of ‘Kerry’s 30th birthday charm’ with a peridot swarovski crystal and a black freshwater pearl. So then I decided to take the rest of the week-end off…to re evaluate…and sort myself out a timetable! As I have said many times before – my favourite ‘chill-out zone’ is our local visitor attraction – Norton Priory Museum and Gardens – so this is where I went to unwind. When I got there it was to discover that they had a special display on. 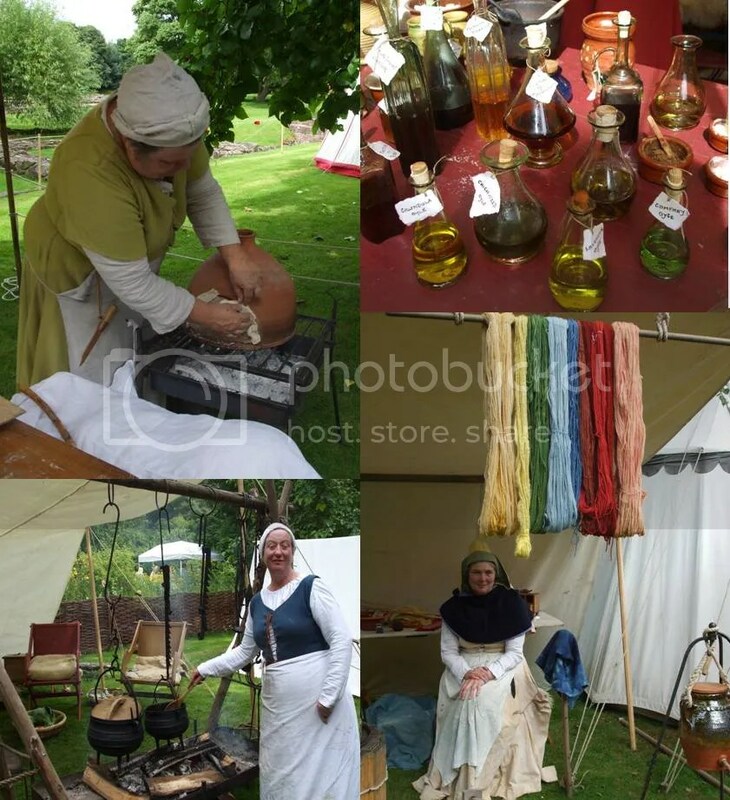 Sir John Myddelton’s Companie of Artisans and Merchants…a historical (Medieval) re-enactment group…were encamped there for the weekend – treating us to a very entertaining display of what life in Middle Age Britain was all about. They were all very knowledgeable and very willing to talk about and demonstrate the ancient skills and trades they had mastered. All their clothing was an accurate reproduction of what people wore back in the 1470s. It was a totally fascinating and entertaining day. I have photographs here of the 2 women who were preparing the dinner for the whole ‘Companie’ that evening – baking bread rolls and preparing a mutton stew and a baked fish….a selection of ‘oyles, tinctures and ointments’ prepared by the Herbalist and some of the amazing colours of wool produced by the Dyer all made from natural vegetable dyes. There was also a Blacksmith, Furniture Maker, Silk Worker, Higgler and Candle Maker and many others. It really was so interesting! The weather was pretty lousy but that didn’t really matter – I had a lovely afternoon! 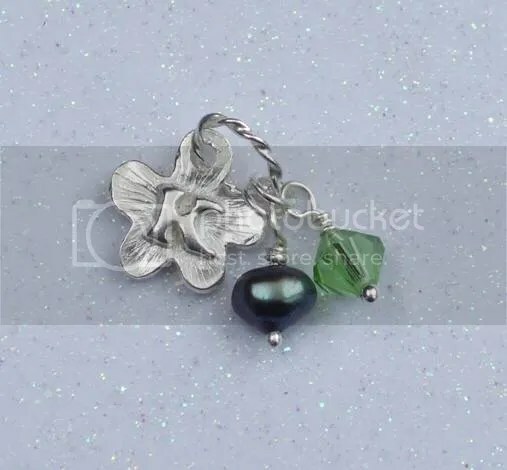 So having had a relaxing weekend, hopefully I will approach next week with a rather more balanced timetable – so that I can make a little bit of jewellery…and have a little bit of interaction on the forum… and have a whole lot of fun! !…now that’s what I call balance!! Well, they may well be eating strawberries and cream at Wimbledon, washed down with champagne…but I’ve got nothing to complain about! My little 5 foot by 7 foot studio (workshop) takes up about a quarter of my tiny postage stamp of a back garden but I believe in making that little patch of soil work for me! Over the last 12 years or so I have planted a rhubarb crown (divided many times since and shared around! ), a thorn less blackberry, 2 blackcurrant bushes, 3 red current bushes, 5 blueberry bushes, a gooseberry bush (which is yet to bear fruit so it had better watch out! ), a little herb garden with 4 types of mint in pots, 2 types of thyme, chives, marjoram, sage, rosemary, bergamot, horseradish and angelica. This summer I have also planted out in pots 4 tomato plants and 2 courgette plants. But as you gardeners out there would know…the raspberry cane I bought about 4 years ago hasn’t stayed where it was planted!! This year – because I have been too busy with Solunar Silver Studio to do much maintenance in the garden I left the raspberry runners to do much as they wanted and they have crept through the soil unchallenged and taken over the whole place!! …their days are numbered – but not before I take all the lovely fruit off of them. Over the past few days, as the weather here in England has been warming up more and more, I have taken to wandering out of my studio between silver fusing activities to have a bit of a break and I have indulged myself by plucking a handfull of raspberries straight off the plant and popping them in my mouth – still warm from the sun and oh, so fragrant! What little treasures! Today the weather has been really hot and heavy as we wait for the promised thunder storm to break. For lunch I sat on my tiny 2 flag stone ‘patio’ under my little strip of canopy and sipped a cup of tea. As I drank I looked over to the straggly raspberry area and saw how many raspberries had ripened over night. A little more than a handful I can tell you! 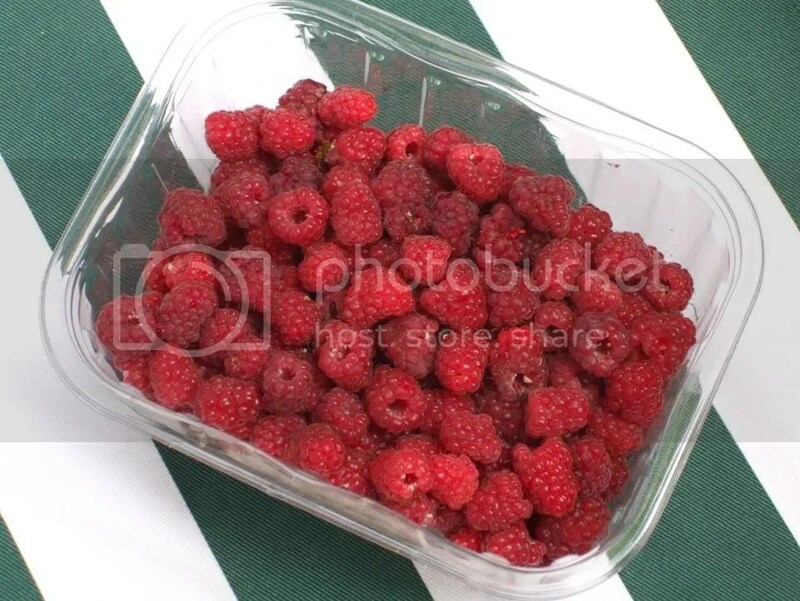 – so after I had finished my tea I collected a plastic punnet from the kitchen and began to pick. 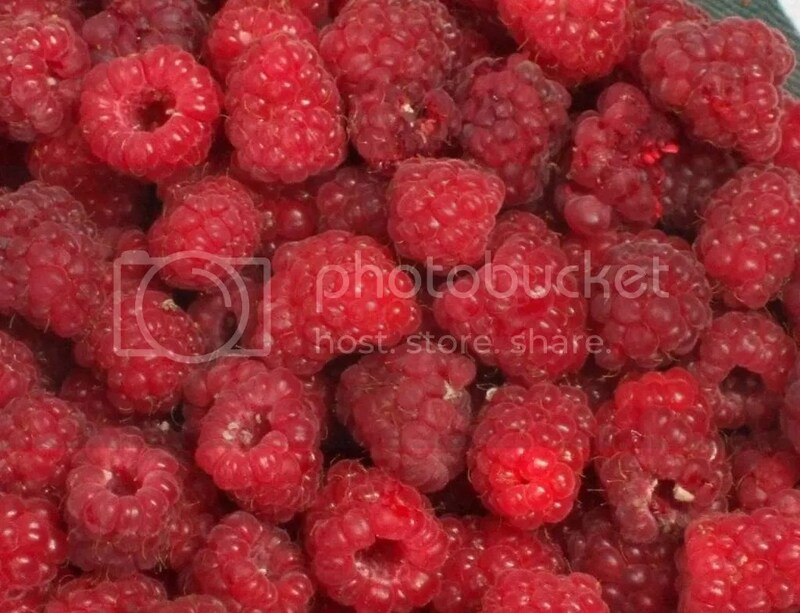 There was hardly a breath of wind and the heat from the sun was making the sweet aroma from the raspberries hang in the air – quite intoxicating! It took me about a quarter of an hour to seek out the majority of the ripened fruit and by the time I had finished my fingers were running red with the raspberry juice. How delightful the simple things in life can be!! There will be a few more punnets of raspberries before this year’s crop is exhausted and then we will move onto the blackberries, which are currently still green, and so on through the summer. I will make something of the raspberries this evening to eat after dinner – but much of this year’s bumper crop will end up as jam – to continue to delight the senses throughout the winter. Nothing can beat the intensity of flavour of home made raspberry jam! I will uproot many of the raspberry runners after the crop has finished and share them around so that others can enjoy the same experience next year. I know my 6 year old granddaughter and her 8 yer old brother are fascinated by the whole process of soft fruit growing (and eating!!) so I will definitely be giving some to their Mum to plant! My Dad learned all about gardening from his Dad and I learned from him…now it’s my turn to pass the baton down to the next generation or two! That’s how life is! Due to circumstances beyond my control, I have had to delay the date that I officially start my new business – Solunar Silver Studio – until the first of July. This has given me time to get to grips with building a website and doing all the other advertising paraphernalia that I feel I will need to get a good launch. I was hoping to be able to pass this responsibility over to someone who has more IT skills than I will ever have but that has never quite happened and so I have been working at it …a little bit here…and a little bit there… I am slowly getting the idea…and today I finally worked out how to get my Solunar Silver Studio logo incorporated into a repeat design that I could use as a wallpaper for my website! I am inordinately pleased with myself!! 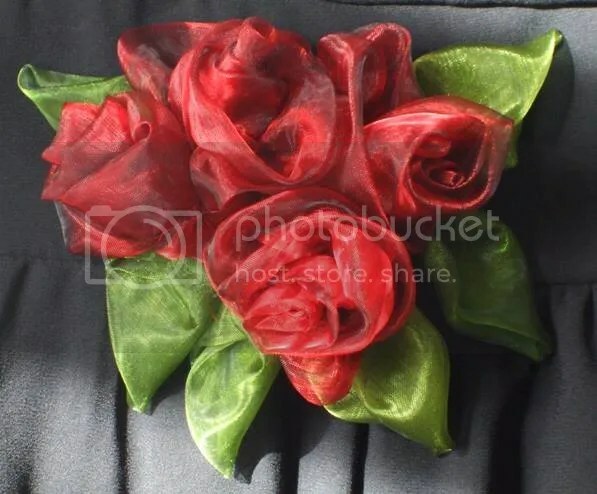 The image above is an enlarged section – just to give you an idea…and a preview…because, of course, you will all come visit my website when I get it going… won’t you!!! I still have a way to go yet but I can see the light at the end of the tunnel – and believe me – it has been a long time coming! 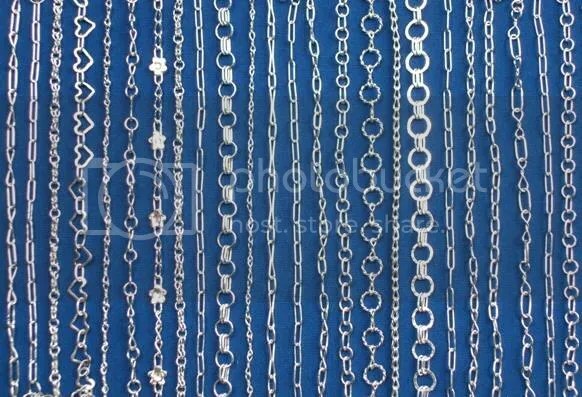 I have also had the time to build up quite a stock in decorative silver chains (mainly bracelets) which is my main interest and delight when it comes to making fine (pure) silver jewellery. This is just a small section (about a third) of the chains I am about to send off to the Edinburgh Assay Office to get my personal hallmark applied to the little heart shaped tags I attach to all of my handmade chains. 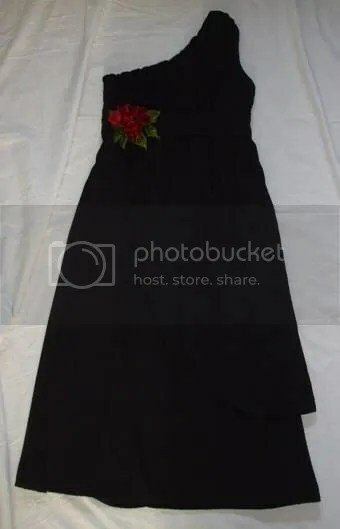 So – I think I can be forgiven for leaving a bit of a gap between this and my previous post…and anyway – people seemed to be interested in my ‘Rose Nose’ post as there has been a pretty constant number of visitors each day over the past week. And, for the record…for anyone wanting to know how the hay fever remedy is working – I have had a couple of days when I was wondering if the effect was wearing off as my nose was itching (but not intolerably) and needed blowing a few times but that was when the pollen count was really high. I have not yet had to resort to any other type of medicine to control the symptoms – I have just continued to use the device as indicated and I have been fine. I’m still reluctant to say it is ‘cured’ but I am having a much more comfortable summer that I usually do! Well, I must get back to doing a bit more on my website building. I’ll let you know when I ‘open the doors’ to Solunar Silver Studio’s on-line presence and look forward to getting some feedback from you all! 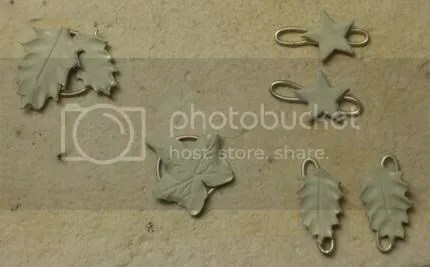 As previous readers of my blog, and followers of Thing-a-Day 2009, know – I work in fine (pure) silver, mostly making decorative chains, but I also dabble in PMC (precious metal clay). 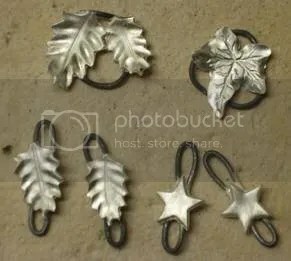 I have never liked to add sterling silver to my work as sterling silver tarnishes so easily – and fine silver doesn’t!! So I feel that sterling doesn’t fit in with the style of jewellery I want to promote at Solunar Silver Studio. Now the only drawback of fine silver is that it is a little weaker than sterling silver. 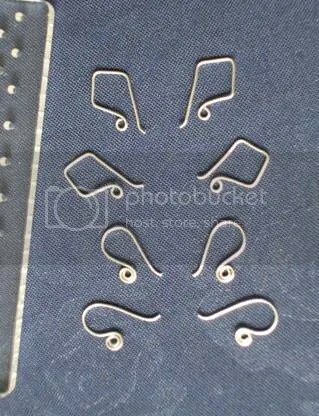 Generally this doesn’t matter but it is a real problem with making earwires for earrings…especially if you hope to sell them. I am happy to wear fine silver earwires because I am aware that I might have to reshape them a bit if the grandchildren swing on my earrings!! … But you can’t sell earrings with that warning on them!! For a while now, I have been aware of the existence of a metal called Argentium – which is basically sterling silver with about 1% of germanium mixed in with it. 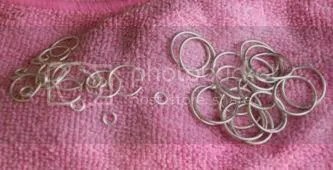 Now that little bit of germanium has the benefit of making the sterling it is mixed with much more tarnish resistant and it makes it even stronger than standard sterling silver…….I thought – “Bring it on! !” – but what is this???? It isn’t available in the UK!!!! WHAT!!!!!!! How cruel life is!! But that is all in the past as since the beginning of June, it has been available in limited forms from one supplier in the UK – Cookson Gold. It is currently only supplied in sheet, wire, earposts and a few other odds and ends – but no earwires!! Ho-hum! Out comes the jig thing I use on occasion, and in goes an order for a couple of metres of 0.7 Argentium wire to have a play with. So today I have been having a play – and I am sold! It makes some very acceptable earwires. It is surprisingly strong and springy and I do believe I am going to order some more…and at last….. I can start making some earrings to go with the rest of the Solunar Silver Studio jewellery range I make! Of course – it will take a bit of time to see how quickly it shows signs of tarnish but so far – so good……Argentium Rules….UK!! My apologies to condron.us readers – I have been neglecting posting recently!